Meine Damen und Herren, Mesdames et Messieurs, Ladies and Gentlement! Willkomen, Bienvenue, Welcome to the Michael Schumacher Cabaret at Hockenheim - with a supporting cast of Felipe Massa and, um, well that's about it really. 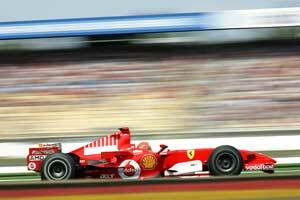 As massacres go the 2006 German Grand Prix was a comprehensive one. A two-man show or perhaps one magician and his little helper. Massa has done very well this year at Ferrari and could probably have taken the lead from Michael after the first pit stops but instead they went side by side for a while and then Felipe, understanding his place in this all-singing, all-dancing Ferrari production, allowed his team leader to take the corner. The German fans came to see Michael. And Michael was what they got. And what of Renault? You might ask. The team that not four weeks ago had won four races in a row. The team that seemed on course for a dominant world title. Well, the Blues were blue. They were fifth and sixth which in rough translation means nowhere. They were beaten not only by Ferrari but by McLaren, by Honda and even - horror or horrors - by a Williams-Cosworth. Admittedly, not all the cars ahead of them finished but Renault cannot afford to let this happen again. The list of fastest laps told the story. Michael and Felipe were split by an almost invisible hair. Kimi Raikkonen was a tenth adrift. Then came the two Toyotas. Then came Mark Webber and Jenson Button. And then eighth and ninth on the list were Giancarlo Fisichella and Fernando Alonso, just a tenth and a bit ahead of the Toro Rosso of Tonio Liuzzi. How can one explain such a situation. If it is down to tyres, how come fellow Michelin-users McLaren and Honda were quicker than the Renaults? How could this happen when Renault said that it had the biggest aerodynamic update of the year and expected to go quicker than previously? Could it really all be down to some strange things called mass dampers? No-one seemed to know the answers to these questions. The Renault people talked about needing to analyse the data and work out what had gone wrong. But with Hungary just a few days away there was precious little chance of that happening. The fact that Ferrari was so far ahead was not the big surprise. It was the performance of the others that was the real shock. The thing was that the opposition was not without its own troubles. We had guessed on Saturday night that Sunday would see another Ferrari massacre because no-one believed that McLaren's pole had been achieved with a decent fuel load. What we did not know was that McLaren had made a big mistake filling Kimi's fuel tank and the Finn did not have anything like the fuel load that he needed for the race. So it was not the Mercedes-Benz PR stunt that it looked like. It was a mistake. What was obscured by this was that the McLaren was actually a much-improved car and if the team had not made a mess of things he might have done even better. Kimi was the only man who went for a three-stop race and in order to make up for the problem he had to do some very odd-lengthed stints. His first was just 10 laps. The second was 18 laps. The third was 27 laps and he ended the afternoon with a 12-lap dash to the flag. This must have involved some serious juggling by the driver and at the end of the race he talked about a number of other problems as well: there had been a slow wheel-change, a problem of tyres blistering and also an hydraulic trouble. Despite all of these disadvantages, Raikkonen finished third which was something for the McLaren men to be cheerful about. It was better for Kimi than for Pedro de la Rosa. He disappeared very early on with a fuel pump failure. In those final laps Kimi attacked and caught and passed Jenson Button's Honda. This too had made a great leap forward as a result of work which was begun months ago when the Hondas were simply embarrassing. The car was examined in great detail. Problems were found, new targets set and everything came back together again for the pre-German GP test at Jerez. And it worked. It was a great deal better and the drivers were enjoying their work again. They were confident in the cars. Alas, Rubens Barrichello suffered an engine fire early on in the race but Button was third most of the way. "I had a lot of fun out there," he said, "but the tyres grained during the last stint and there was nothing I could do to stop Kimi. But I am happy he said. We have made a definite step forward. It looks like we are getting back into it." An even bigger surprise came from Williams, given the recent weeks that the team has suffered through. Mark Webber started with a heavy fuel load and so was well-placed as the lightweights started to pit. Mark went on until lap 28 by which time he was up to third. The pattern was repeated with the second stint and he was fifth on the run to the flag. And he would have stayed there all the way to some points but for a water pipe that failed. Once again a small detail had ruined Mark's day. He seemed his usual steady self after the race but no racing driver can put up with endless pain forever. They need a little help from Lady Luck. Still, Mark was better off than Nico Rosberg who blew his chances by falling over himself on the first lap. Not a great effort. Still, he could have been Jacques Villeneuve who not only screwed his own chances but also took off his BMW team mate while the management of BMW sat in the Paddock Club sipping cocktails. On the other hand it was a bad weekend to be a Renault driver. Fifth and sixth was a horrible result for the team and did not reflect the true state of affairs. Alonso was very lucky as when he went bouncing off the track on his 61st lap, Giancarlo Fisichella was behind him, able to protect his back from a snapping Jarno Trulli. If he had not blown an engine in qualifying he might have achieved great things. Ralf Schumacher might also have done well but he seemed to be having one of those weekends when whatever he did ended him in trouble. He ran into Pedro de la Rosa in qualifying and then nearly drove into Jenson Button in the pitlane. In the race he tangled with David Coulthard on the first lap. Then he got busted for speeding in the pitlane and ended up ninth. And all of this opened the way for Michael and Felipe to appear to have an amazing dominance. "We have had a superb weekend," said Michael. "I was a bit surprised to be that much in front, but we'll take it. It is the right moment in time for such performance to close the gap and keep the pressure on. "It was a perfect weekend for all of us." If Felipe Massa looked a bit glum it was only because he would like to win a race one day.